Asiana Airlines, the nation’s second-largest carrier by sales, closed 0.37 percent lower from the previous day, trading at 4,050 won ($3.58) per share. Budget airlines T’way and Jin Air also slipped 1.35 percent and 0.64 percent to 8,010 won and 23,450 won, respectively. Though it performed poorly throughout the day, South Korea’s No. 1 flagship carrier Korean Air eventually ended flat at 33,450 won per share. 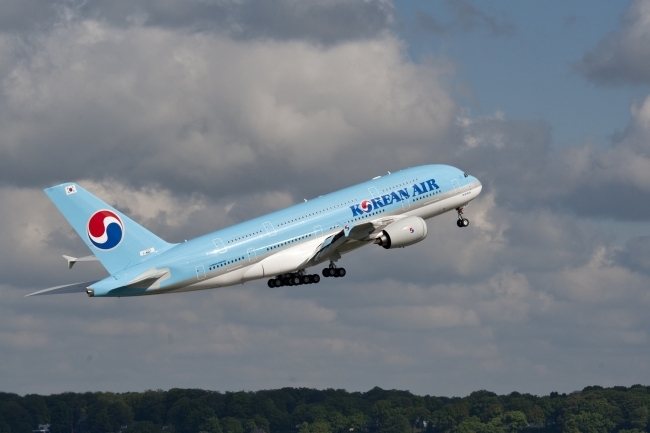 The plunge across the aviation sector came after most carriers saw a brief rise in their share prices earlier this week upon news of a deal between Seoul and Beijing to increase air traffic between them. The two have agreed to increase the frequency of weekly flights. Frequency of passenger flights will be increased from the previous 548 to 608, while air cargo shipments will rise to 54 from 44, according to a joint announcement Friday. “The news of air traffic buoyed the stocks at first, but with South Korea’s Ministry of Land, Infrastructure and Transport yet to release any follow-up details, it now depends on how each airline will get the better side of the bargain,” Bang Min-jin, an analyst at Yujin Investment & Securities, said in a Wednesday note. Analysts also noted the latest Boeing 737 Max 8 incident coupled with an expected surge in oil prices will drag stocks further down. “T’way initially planned to add six new jets to its portfolio this year, but now they can only add two. This is likely to negatively affect the market consensus on its sale projection,” said Lee Jong-hyun of Meritz Securities.